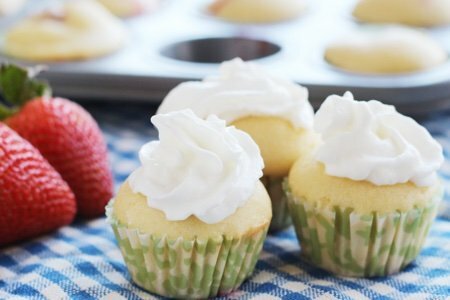 Before you freak out, these easy strawberry shortcake cupcakes are not your average cupcake. First, they are mini (portion size!). Second, they do not feature buttercream frosting and, third, they are half fruit. Remain calm. I can’t do real cupcakes on this blog and get away with it. These ARE cupcakes but only in the sense that I used a cupcake pan to make them. 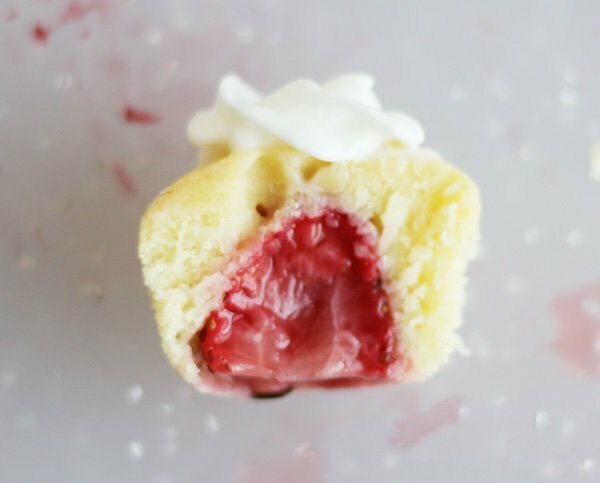 I cut a conventional cupcake recipe in half and packed them with strawberries. But they are only 52 calories each (take that 350 calorie cupcake!). Why are cupcakes mostly frosting? I wonder about these things late at night. Every year, I attempt another healthy strawberry recipe. Why? Because I love strawberries and you can never have too many ways to eat them. 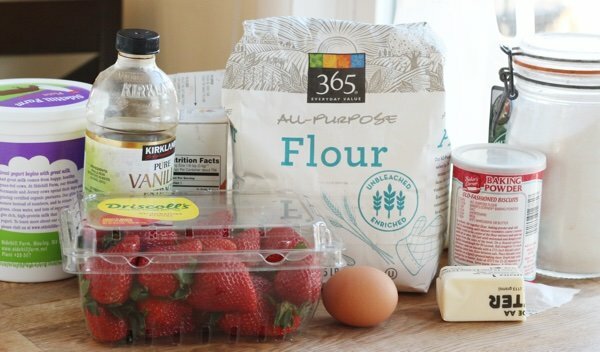 One of my favorites is my stuffed strawberry recipe because it tastes like cheesecake (not kidding). You should also try my DIY Strawberry Frozen Yogurt – so good! These will fill your heart with joy because they are small and satisfying at the same time. 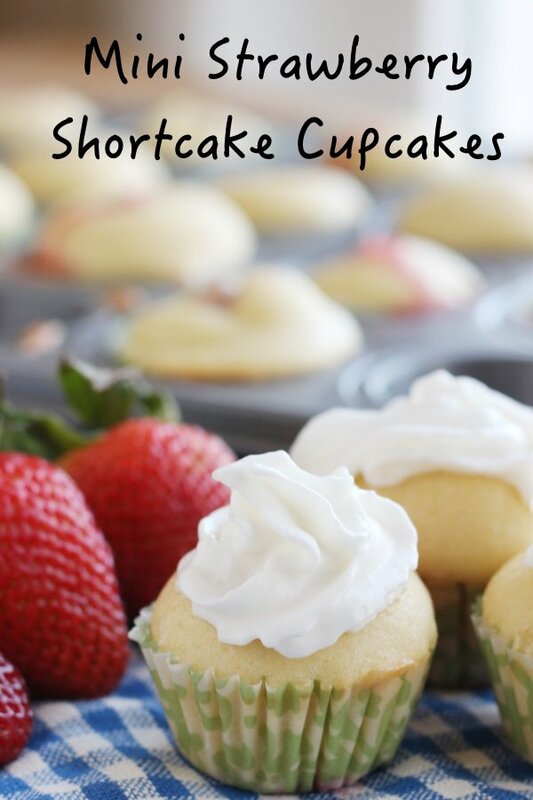 I love how you get a little bit of cake, a big bite of strawberry, and a little whipped cream – strawberry shortcake – but the serving is perfect. I only use about ½ to 2/3 of the strawberry (depending on the size). Go ahead and snack on the left over bottoms. Yum! The strawberry cooks inside the cake to make it a little bit “jammy” – which is delicious. Don’t put the whipped cream on when they are hot or too far in advance of serving them. The cream will melt or soak into to the cupcake making them soggy (yuck). I prepare the cupcakes in advance and right before it is time to eat them – hit it with the whipped cream. What is your favorite way to serve strawberries? Heat oven to 350 F. Line a mini cupcake pan with cupcake liners. Mix flour, baking soda, baking powder, and salt in a small bowl. 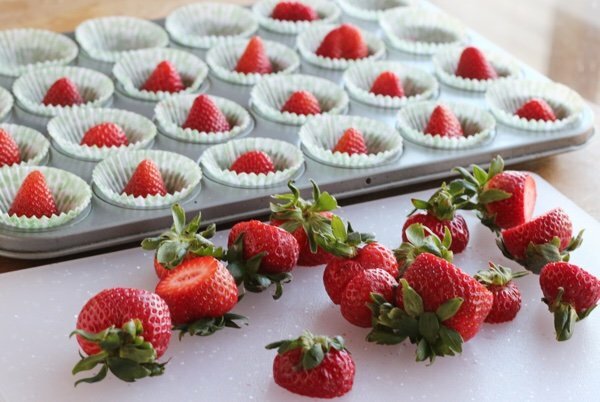 Slice off tips of strawberries and put them tip up in liners (use about half the strawberry or so). Mix butter, sugar, egg, milk, and yogurt with a mixer or by hand until smooth. Add flour mixture in four portions and mix until fully incorporated. Pour mixture over strawberries until liner is almost full. Bake for 11-14 minutes until a toothpick comes out clean from the batter section of the cupcake. Cool and serve with a dollop of whipped cream on top. This is such a sweet idea! Do you think these would freeze well or would full-size do better? I try to eat healthily and as such, most of my desserts are fruit, chia pudding, home-made goodies like fiber muffins, cookies, a rare brownie, etc. Baking for one means I have quite a stash of goodies in my freezer for pop-in visitors, and I'd love to add this 'strawberry shortcake' cutie. What an amazing idea! So clever and yummy. Awesome cupcakes. Any suggestions for substituting the 1/2 cup sugar ? Bless you for making this from scratch! I see so many interesting recipes but they use box mixes which I won't use. Great idea to put fresh strawberry in the center. How about reducing SmartPoints by replacing milk & sugar with unsweetened almond (or other nut) milk & stevia (or sucralose)?? These are brilliant Snack Girl! I'll put my kids on these right away! It says 24 cupcakes but only need 12 strawberries. Are the strawberries sliced in half. Could you change the printable version of your recipes to include a photo?